What do you think of ’70s fashion? I ask because I feel like the answer to this can easily fall into two camps. Either you think, “Seventies fashion? Right on! Flares, bohemian peasant tops, and disco dresses—I’m down with all of that.” Then again, you may think, “Ugh. No thank you! The days of disco are over and polyester is not my friend.” Both have very valid points. Personally, I love finding ’70s fashion. I’ve always been attracted to fun ’70s prints and there are some really fabulous vintage finds from the era, you just have to look hard enough. 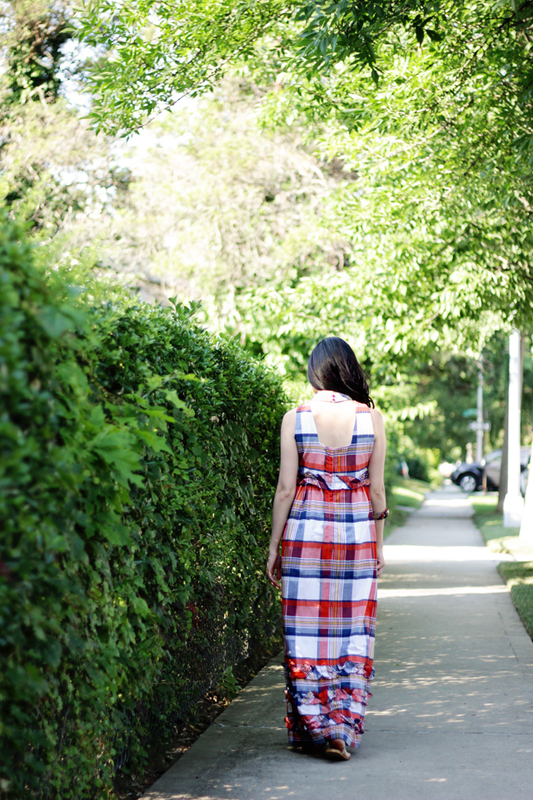 If you’d like to make this dress yours, you’re in luck because this maxi is part of my hand-picked vintage collection. Just head over to my Etsy shop, here. Previous Post OOTD: Today, it’s cutoffs and speed bumps. Next Post OOTD: Today, love is not a label.